The Paraguay River is an essential lifeblood for the landlocked country that shares it name. It provides Paraguayans with fishing, irrigation for agriculture and access to shipping. But it’s also prone to seasonal flooding, with especially high consequences for the populations living on its banks, including where it skirts Paraguay’s capital, Asunción. 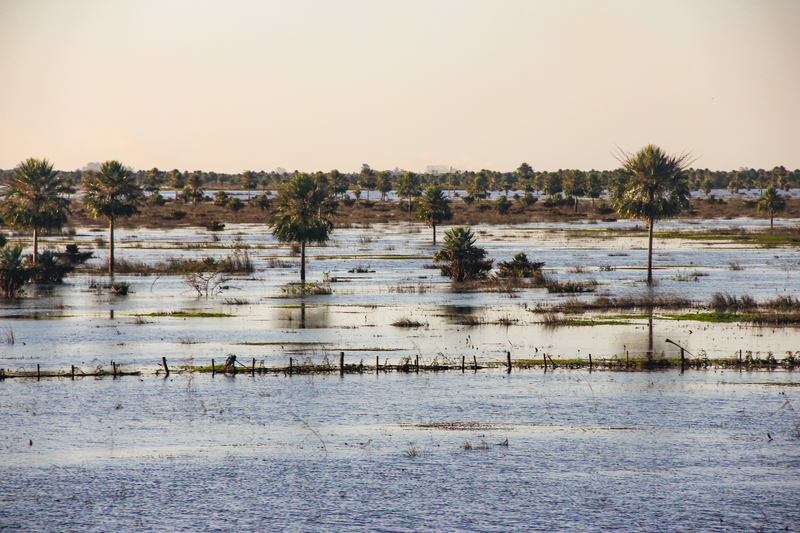 Flooding in January 2016 along a small river around 50 miles from Asunción, Paraguay. “Most cities in Paraguay are along either the Paraguay or Paraná Rivers, and the populations in riverine cities in Paraguay and downstream countries are growing rapidly, so understanding the drivers of this particular flood is crucial,” said study author James Doss-Gollin. Photo: Lidia Florencia Pérez de Molas/Universidad Nacional de Asunción. In late 2015, heavy rains gave the region some of its most intense flooding in the last half century. According to the Paraguayan Red Cross, the Paraguay River, Paraná River and at least seven other rivers overflowed their banks, and the BBC reported that more than 150,000 people were evacuated in Paraguay and Argentina. The disaster left 120,000 people in Asunción without power. Meteorological experts and humanitarian officials at the time cited El Niño as a contributing factor to the heavy rainfall, and seasonal forecasts issued as far back as June 2015 indicated an increase in chances for above-average rainfall in the region for the last few months of 2015, in large part because climate models at the time were predicting the El Niño event. A new paper in the Journal of Climate provides a closer look at the role of El Niño in the 2015 flooding event, as well as other weather and climate factors that contributed to the heavy rains. The authors of the paper provide an analysis of how well seasonal forecasts predicted the heavy rain and find that forecasting at a subseasonal scale shows promise for the region. They also analyze how climate processes on several different timescales came together for this heavy rain event to manifest. The authors of this paper used the IRI Data Library for post-processing S2S data, and the Climate Predictability Tool for statistical analysis. Both tools are freely available from IRI. Scientists have shown that El Niño tends to strengthen the flow of moisture coming from both the Amazon and the Atlantic Ocean via a ribbon of winds called the South American Low-Level Jet. In the past that flow of moisture has moved around and has tended to track a little south of Paraguay. But in late 2015, the strengthened flow didn’t meander as it had in the past – instead of a flailing fire hose, unseen forces aimed the hose at Paraguay and kept it there. But those forces might not be so invisible after all. Doss-Gollin and his coauthors use several methods to try to diagnose why the heavy rainfall occurred when and where it did, including why the track became stuck. One of their approaches is called weather typing, which uses statistics to quantitatively define the different recurring atmospheric wind patterns seen in an area. These wind patterns are the underlying drivers of weather conditions. Using the weather types and other methods, Doss-Gollin, Muñoz and co-authors Simon Mason from IRI and Max Pastén from Paraguay’s meteorological service (DMH) found that in addition to El Niño, the heavy rainfall in late 2015 was influenced by the Madden Julian Oscillation and by interactions between the Pacific and Atlantic Ocean basins. While the seasonal rainfall forecasts predicted higher odds for heavy rainfall in the region, they didn’t get the location of this rainfall quite right. The authors concluded that the seasonal models were off in part because they weren’t capturing the influence from the Pacific-Atlantic interaction. Time series of area-averaged rainfall in the Lower Paraguay River Basin for each day from November 2015 to February 2016. The grey line indicates the rainfall value in millimeters/day. 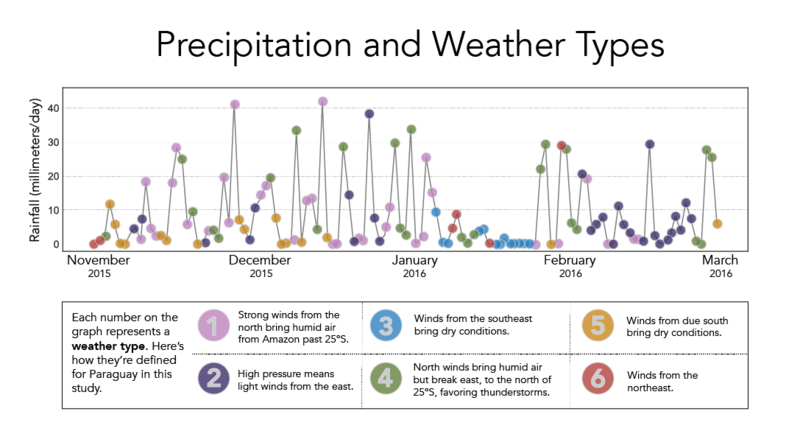 The circles indicate the weather type corresponding to each day. Adapted from Figure 7 of the study. The authors also used statistical methods to build on and try to improve the outputs of physics-based subseasonal climate models. They found that adding statistical correction resulted in substantially improved forecasts, suggesting that subseasonal forecasts for heavy rain events might be possible in this region. “We now have a sense of how different sources of climate variability at multiple timescales came together to create this rainfall event, and how experimental subseasonal forecasts can potentially predict similar events in the future,” said Muñoz. The applicability of these results for use in operational forecasts is not just theoretical. “Here at the Paraguayan Meteorological Office, we are very interested in having an operational forecast system at subseasonal-to-seasonal timescales,” said co-author Pastén, a Professor at the National University of Asunción (Paraguay) who also works at DMH. “This study is showing us a clear path for its implementation, and we expect to do it soon with the collaboration of the Latin American Observatory of Climate Events and the support of my co-authors”.